#HAIRPROBLEMS: Why don't my curls look like THAT?! Does this scenario sound familiar? You've been scrolling through Instagram and you've finally found the perfect curly hair inspiration pic. It's something bouncy and voluminous, a style that seems quick and easy enough to achieve on your own, and it has the perfect amount of glam. You sit in front of the mirror and go to work. 30 minutes later you have the finished product. It looks good, but it doesn't look quite like the photo on IG. Your curls are falling, frizzing and you have to double check to make sure you didn't find the inspiration under #wastehertime2016. If this is you, fear not! We have some tips and tricks that the IG pictures won't tell you on how to achieve better curls! All you need is your hot tool of choice and a few light products. 1. Moisturize Properly: It's no secret that dry hair is susceptible to frizzing, and nothing ruins a good curl like frizz! The key to beating this is in the early stages of styling. Before drying your hair be sure to lightly apply your moisturizer of choice and detangle. 2. Air dry your hair: Instead of blowdrying your hair straight in preparation for your curls, try letting your hair air dry. This works especially well with curly or wavy hair and helps to achieve a tighter, longer-lasting curl. 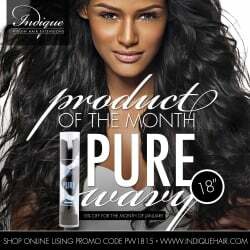 If you're a hair extension wearer, try this with Indique PURE Curly or PURE Wavy textures. 3. Curl in the opposite direction: Let your curls run free! Curl left, curl right, curl big or small. Uniform curls can be a bit boring at times. Plus, this will help to add more volume! 4. Let your hair cool off before separating your curls: This helps to set your curls. That way, when you finger through you hair, you won't be brushing it straight again. 5. Finish with a shine serum. After you've perfected your style, use a shine serum to add a healthy sheen to your hair. This will also help to keep your curls looking fresh and reduce frizz. Six Habits to Stick to For the BEST 2016.